Golden Week, starting in the first week of May, is one of the biggest holidays of the year in Japan. 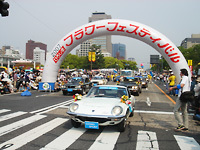 This year, Mazda is celebrating with a Zoom-Zoom Parade through the main streets of its hometown, Hiroshima. The event is kicked off with classic cars (led by a Cosmo Sports in this photo) and will also honor the Demio (aka Mazda 2) being named the 2008 World Car of the Year and the launch of the new Atenza. The parade takes place on May 3. This post is filed under: events, japan, mazda.